I have achieved camera bag nirvana. Not just camera bag nirvana, even: carry-on travel luggage daily purse everything bag nirvana. I am incredibly picky about my bags, which you might not guess because I own six thousand of them. But in the past, something has always been wrong with all of them: not sturdy enough, not big enough, not enough pockets, weird pockets, anything you can think of, I’ve got a bag that’s got it wrong with it. So I set out to create my own camera bag, mostly for long-term jobs like festivals or out of town shoots, and I have reached it. I started with a ’70s Samsonite flight attendant carry-on, for which I paid $25 on Etsy, from Finishing Touch Resale. The size, shape, and sturdiness of both the sides (it stands up on its own, unlike my beloved H&M canvas bag) made it perfect. 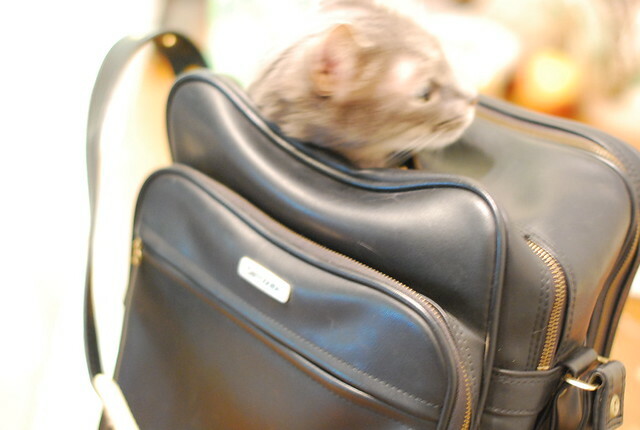 (Also, it had a lot of pockets, and you could fit a cat in it, which was a plus.) But the strap wasn’t long enough to sling across my chest, so I took the bag to the Shoe Repair in Chapel Hill, where they added eight inches to the length of the strap in a flawless process that cost me $15. That still left me with a great bag with zero protection for my gear, and I’m a klutz: I fall down a lot, often while carrying my camera bag. This past spring in Raleigh, I wiped out on the sidewalk and only the strength of my Crumpler 6 Million Dollar Home saved my 50mm lens. (I love my Crumpler, and it’s a great bag, but it just doesn’t hold enough for what I need these days when I’m on a job.) So I commissioned a Martilena camera bag liner, which was the most expensive part of the process, and totally worth it at $60. It’s bright pink, it was made to my exact specifications, and it turns the big inside pocket of my bag from a big empty space into an easy to access space that will hold two cameras, four lenses, and whatever toy film messes I want to toss in, plus my Kindle touch. Put together, the bag holds all my gear, plus anything else I would want to work a festival — a makeup case, my phone, all the fiddly stuff I carry in my camera bag now: spare SD cards and batteries, my MOO minicards, film canisters full of Advil and earplus, permanent markers, tiny dinosaurs, kazoos, mustaches on sticks. And the best part is that it’s big enough that the weight is distributed well. It’s full of stuff, but it doesn’t feel full of stuff. It’ll be the perfect carry-on for when I travel, because I won’t just have to toss all my stuff into one big compartment like with my purses or my LL Bean tote bag. 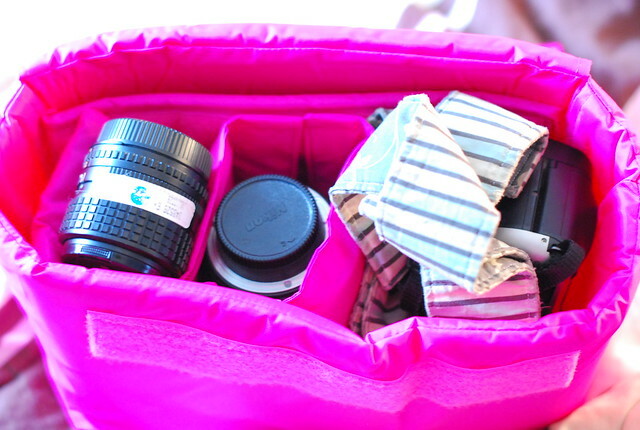 It’s the perfect camera bag, it cost me $100, and I assembled it myself!